Ok, I admit it. For the most part I am a slug. I’ve never been athletic. My favorite hobbies include activities like reading, gardening, cooking, knitting and crafts. I do like to be out in nature, so hiking and biking have appeal. Gyms generally make me feel like a hamster in a cage and I can only get through the experience by dosing myself liberally with my favorite music. As a younger person raising children I was forced into a certain level of activity. In my 65th year it was another story. Florida’s heat and humidity amplified my tendency to avoid moving. Current research links a sedentary lifestyle to a host of medical conditions that only worsen with age. Mental acuity as one ages also appears linked to physical activity. I became worried that I would age more quickly if I didn’t make some lifestyle changes. But, slug that I am, lifestyle changes don’t come easily. Sometimes I have to trick myself into them. Moving to downtown Boston was one of those tricks. Living where a car is a disadvantage makes walking more a part of everyday life. (No, we haven’t sold the car yet, but yes we are inching closer to doing it.) It’s not something I have to set aside time for. We walk to the pharmacy, the movies, restaurants, church and shops. If things are farther away we walk to the T stop and take the train. 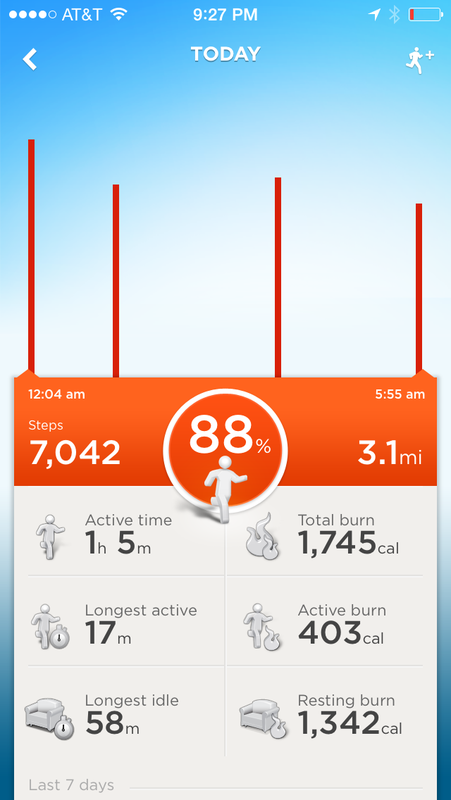 Last August Bill and I bought Jawbone UPs. 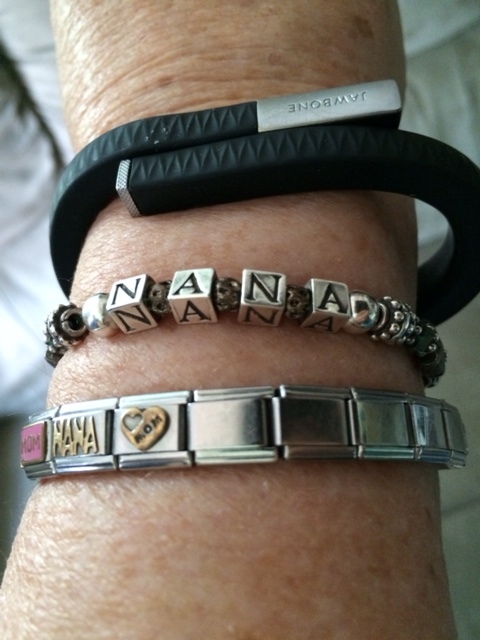 This device, worn as a bracelet, tracks the number of steps we take each day, how long we’re active and inactive, how much we sleep and how much of that sleep is deep and light. Another trick I use on myself is my natural competitiveness: I keep wanting to best my number of steps. It also helps that Bill is wearing one too. I really don’t want him to get too far ahead of me in steps, so I’m more motivated to go for an extra walk or take the stairs instead of the elevator. I can also program my UP to vibrate if I sit still too long. I don’t have it set up that way at the moment – maybe the slug still has the upper hand there. Have I noticed any changes? 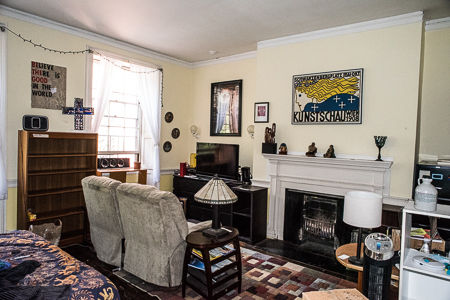 I did lose 10 – 12 pounds in the first several months we lived here without really trying to. I can now walk back up the hill to our house without having to stop and rest halfway there. I get to see amazing things that I wouldn’t notice if I were driving. People plant beautiful things in urns and window boxes. 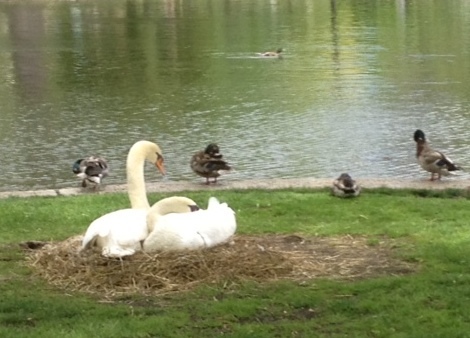 There are swans nesting in the Public Garden. I walk by at least every other day to see if the eggs have hatched. I’d like to say I’m a convert to exercising, but I know only too well how easily I could backslide. I need my life to be set up in a way that exercise happens naturally. This entry was posted in Aging, Around Boston and tagged Posted by Carol Mitchell. Bookmark the permalink. ← High-tech kitchen app: Just how fresh is that coffee?